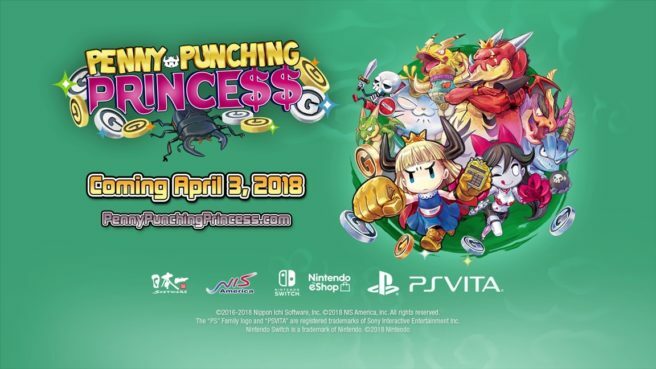 Following its announcement last year, Penny-Punching Princess now has a release date. The game is slated for April 3 in North America, March 30 in Europe, and Australia on April 13. We just received the news from NIS America’s ongoing press event. Accompanying today’s announcement is a new trailer for Penny-Punching Princess. We have the video and further information about the title below. You besta believe I’m in love with money, hun! Play as Princess, the main protagonist in this isometric brawler, who loses her family and overall rule of the land from the evil Dragonloan family. Regain Princess’s kingdom as she punches, traps, and bribes her way to victory. Meet a colorful cast, including a zombie freeloader, Isabella, and find out the real truths about her father, the almighty Money God, and how her surroundings became a capitalist society. – Cash Rules Everything Around Me – Fight smarter, not harder! Bribe your enemies to fight for you, or activate deadly traps to turn the tide of battle in this fast-paced brawler. – Who Says You Can’t Buy Popularity – Recruit/Buy flunkies to your cause to unlock stronger equipment and master over 70 special moves based on weapons you craft! – A Madcap Romp of Dollars & Dragons – Embark on a wildly funny adventure as Princess, a girl robbed of her royal heritage in a world obsessed with money.